Thursday marks the 64th anniversary of the Supreme Court abolishing segregated schools in the landmark Brown v. Board of Education case. That means a generation of Americans has been born, attended public schools, matured into adulthood, raised children of their own, and now reached retirement age — all outside the shadow of America’s own system of legal apartheid. This year’s commemoration will be bittersweet for many education activists: Linda Brown — who was in third grade when her father sued the Topeka Board of Education, seeking to force her enrollment in a nearby all-white school — died in March at the age of 75. It was in her name that the court voted unanimously to uproot racial bias from education, precipitating a long-delayed social and political movement to fulfill the promises of the Founding Fathers. But is the fire ebbing in 2018? De jure segregation may be a thing of the past, but each day, some facet of racial inequity seems to emerge in our media, politics, or culture. In fact, the question of whether America offers everyone a fair deal may be the central question of our time. Particularly since the 2016 election, our narrative of progress and justice for all citizens is increasingly viewed with a jaundiced eye. It can be difficult to quantify the milestones on the path to higher ground — imagine a mostly flatlined chart depicting the growth of black presidents that spikes in 2009 — but social science can give us a clearer picture of the trends shaping the United States more than half a century after Brown v. Board of Education. The images attempt to capture how far we’ve come in the past 64 years, in the classroom and society at large — and what lies ahead. One of the hottest debates in education policy today centers on the ultimate legacy of Brown: whether public schools have succeeded in bringing together white and minority students. Some scholars and activists say that, following an energetic (if controversial) campaign of busing during the 1970s and ’80s, schools around the country have begun to resegregate, with white and black students growing more isolated from one another. Skeptics respond by citing demographic changes that have made the American education system more diverse overall, shrinking the number of majority-white schools to integrate. A separate dustup has developed around school choice: Media analyses over the past few years have asserted that urban charter schools, which often enroll huge populations of black and Hispanic students, have made racial segregation worse. Charter defenders certainly haven’t taken well to that line of reasoning, and many counter that charter schools have largely appeared in neighborhoods already sharply divided by race. 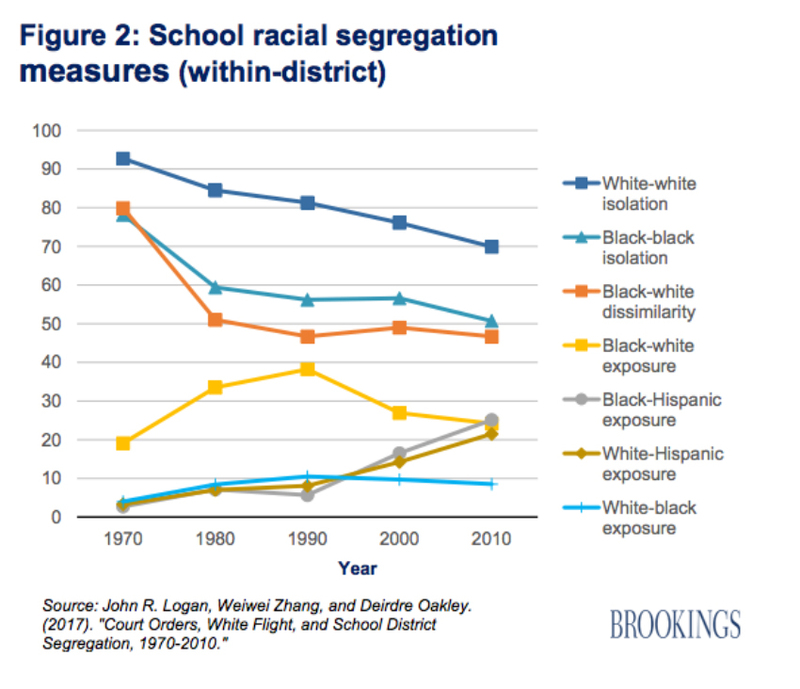 Russ Whitehurst, an expert in education research and the founding director of the Institute of Education Sciences at the U.S. Department of Education, has explored the question of resegregation in a series of reports for the Brookings Institution. 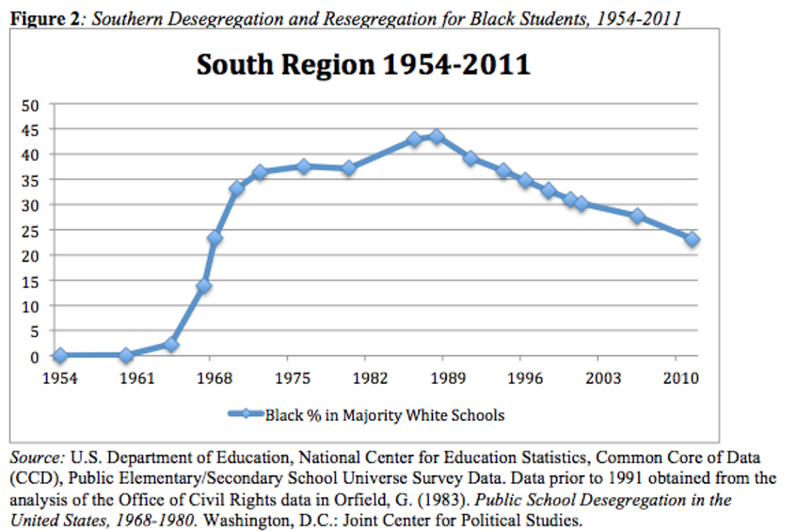 He argues that, contrary to the most pessimistic assertions of some commentators, school segregation has declined on the whole since the civil rights era. 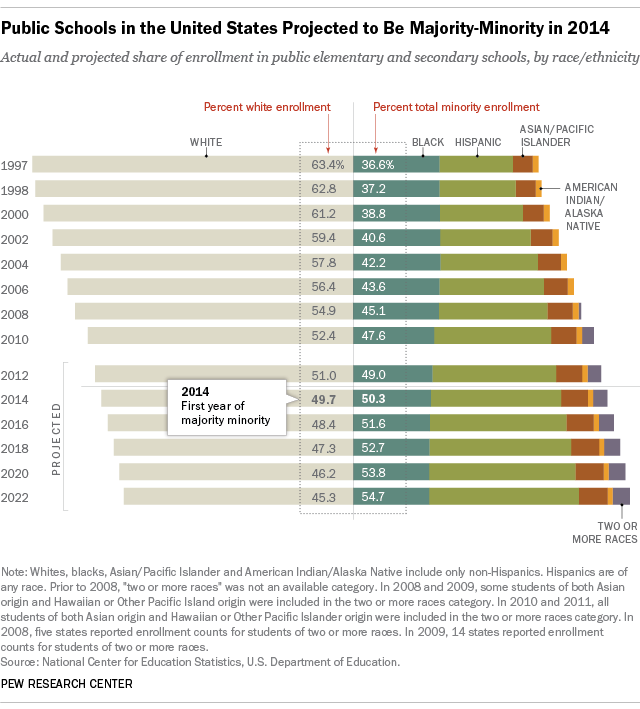 That said, most of that progress in white-minority exposure has come from the enormous increase in the number of Hispanic and Asian-American students. Consequently, the percentages of both black and white students attending schools almost exclusively populated by members of their own race have plummeted since 1970. By contrast, black-white exposure (the percentage of black students attending predominantly white schools) peaked around 1990 and has declined significantly over the past three decades. The problem of racial isolation is exacerbated by district lines, he notes, which often divide cities and neighborhoods fairly neatly by race. The question is: Why did progress toward racial diversity in public schools hit is high-water mark in the late ’80s and early ’90s? Some experts point to the Supreme Court’s ruling in 1991 that federal desegregation orders were never meant to continue in perpetuity, and that some districts could be released from them. 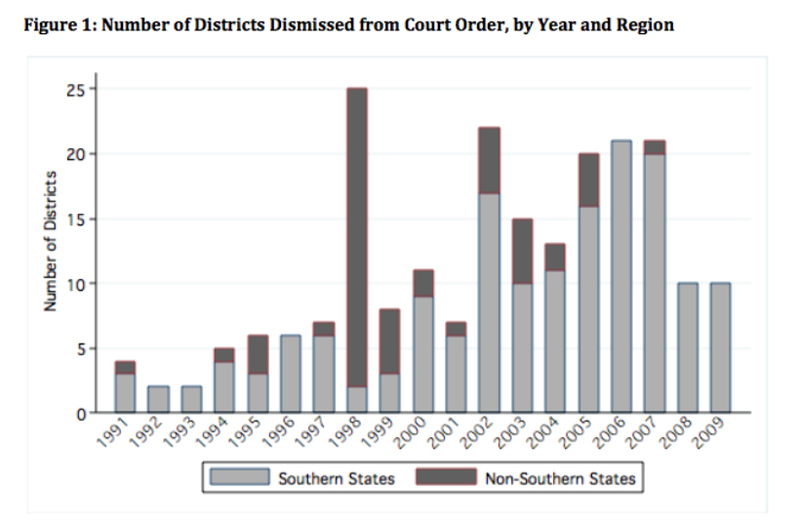 Since then, hundreds of those orders have been dismissed, mostly in the South. Predictably, the weakening or elimination of court orders mandating integration has led to major reversals. The University of California’s Civil Rights Project has shown a receding tide of black students enrolled at majority-white schools in Southern states. From the mid-’60s to the late ’80s, the region made by far the greatest strides in the country in ending segregation. (They had the most ground to make up, of course.) But schools there are now “substantially more segregated” than they were in the 1970s, the researchers claim. In terms of performance in school, historical trends among black and white achievement closely mirror those of black-white exposure. After steadily closing in the first few decades after Brown, disparities between black students and white students on standardized tests strongly reasserted themselves in the 1990s. The black-white gap in reading scores on the National Assessment of Educational Progress, commonly referred to as the Nation’s Report Card, was reduced by more than half between 1971 and 1988. Since then, it has inflated by nearly one-third — though that development is largely a reflection of a sizable, and puzzling, drop in black scores between the years 1988 and 1996. The uneven academic playing field is reflected in terms of coursework as well. Though they make up a declining segment of the overall school population, white students still make up a disproportionate segment of those enrolled in advanced classes in K-12 schools. 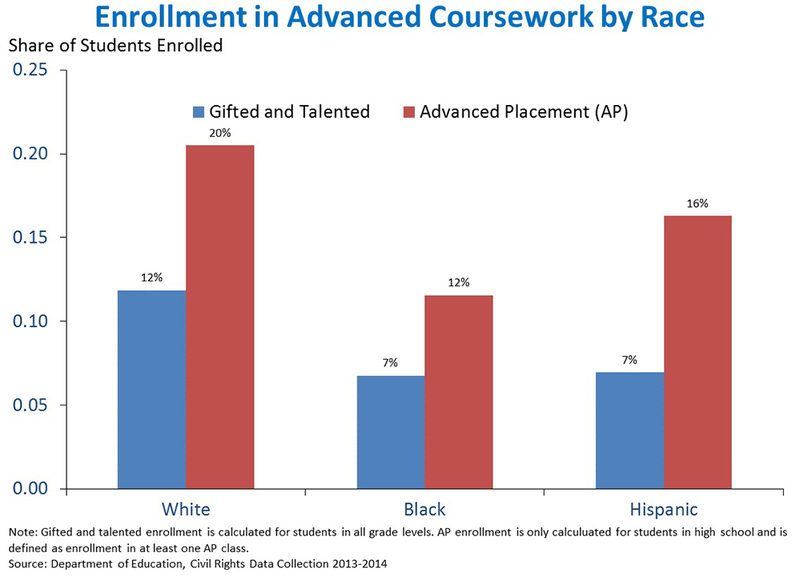 A 2016 report from the Obama administration revealed that just over half the percentage of black students are enrolled in AP classes, or in gifted and talented programs, as white students. Hispanic students are similarly underrepresented. The inequities in education are reflected in public opinion. While Americans are notorious for insisting that their local schools are shining stars in an otherwise failing education system, blacks believe the opposite. 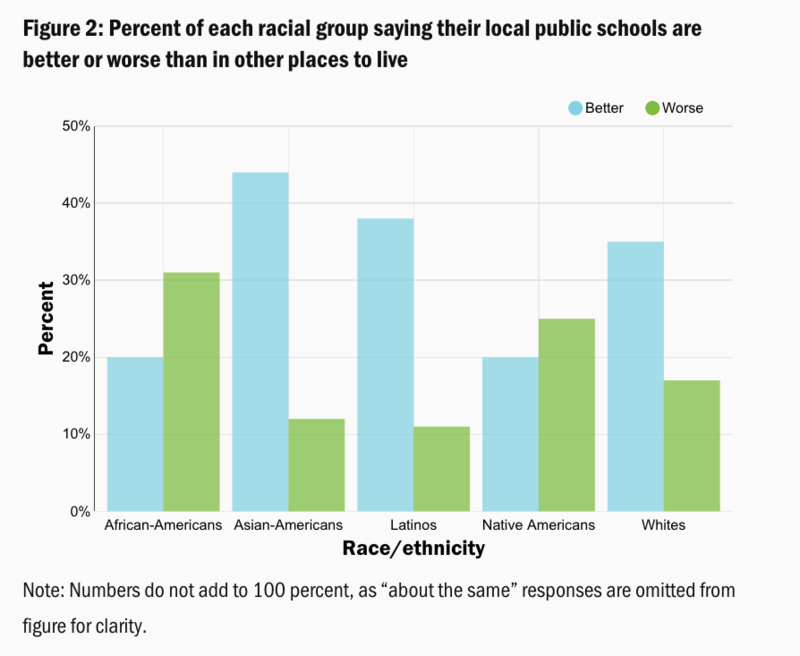 A poll from the Robert Wood Johnson Foundation shows that over 30 percent of blacks believe that their local schools are worse than in other places, while about 20 percent think that they are better. And all this doesn’t touch upon perhaps the most controversial way in which the experience of black and white students differs: school discipline. Missing school because of a suspension — and certainly being expelled from school or arrested for a classroom offense — is one of the worst things that can happen to a student. It disrupts their learning and brands them with a disciplinary record for the rest of their student careers. 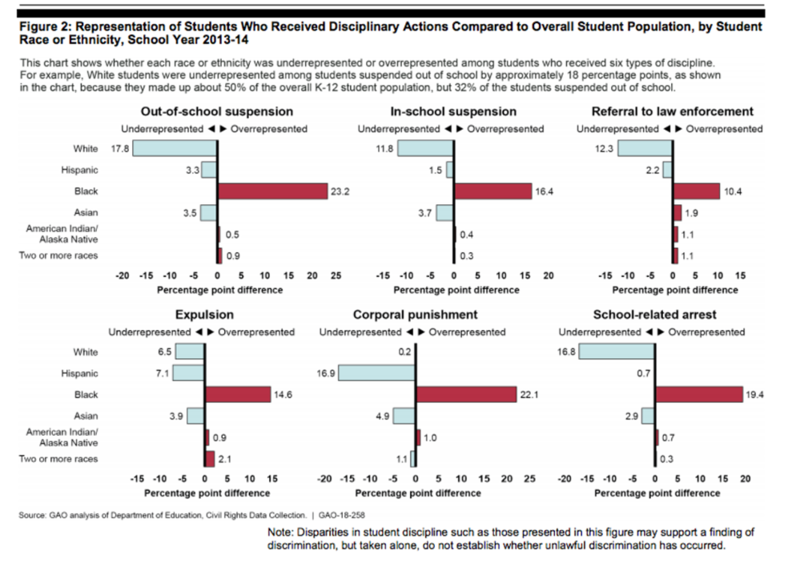 And black students are, by far, the most likely group to experience the adverse consequences of punishment in school. A report from the Government Accountability Office showed that, in the 2013–14 school year, white students were the most underrepresented racial group in terms of suspensions, corporal punishment, referrals to law enforcement, and school-related arrests. 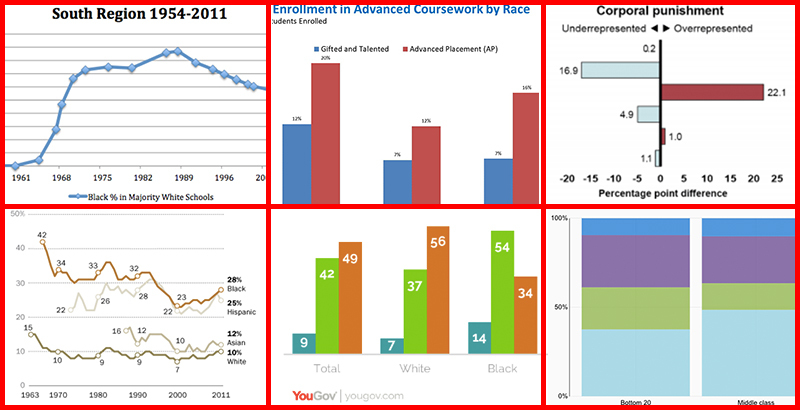 Black students were the most overrepresented in all categories. Stark as those realities are, it actually gets worse: Study after study has shown that black students are not only much more likely to get into trouble than white students — they are more likely to incur harsher punishments for the exact same infractions. White and Asian students are less likely to be sent to the principal’s office, suspended, or expelled for committing the same offenses as black and Hispanic students. 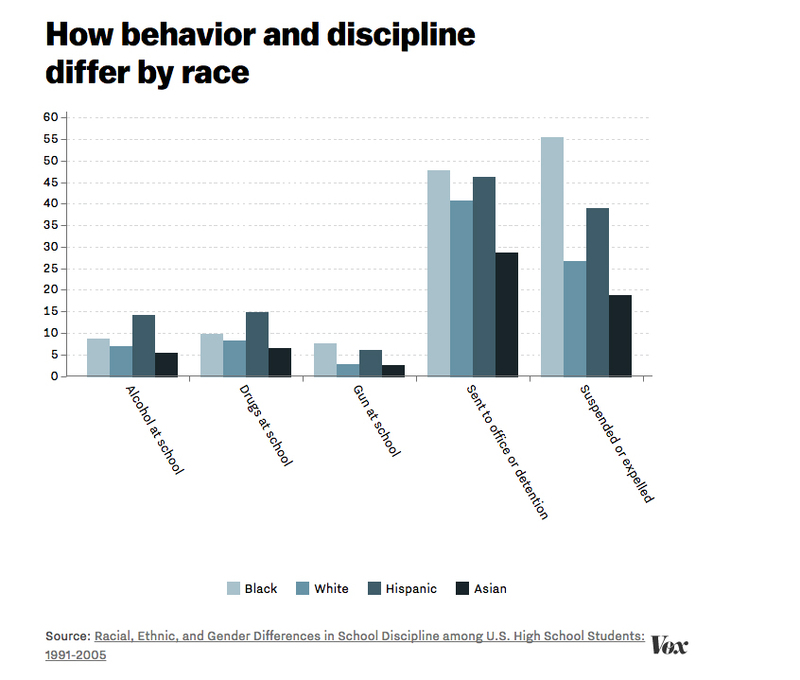 Discipline is clearly more severe for students of color — which is perhaps a logical consequence of the racial mismatch between teachers and students in the classroom. 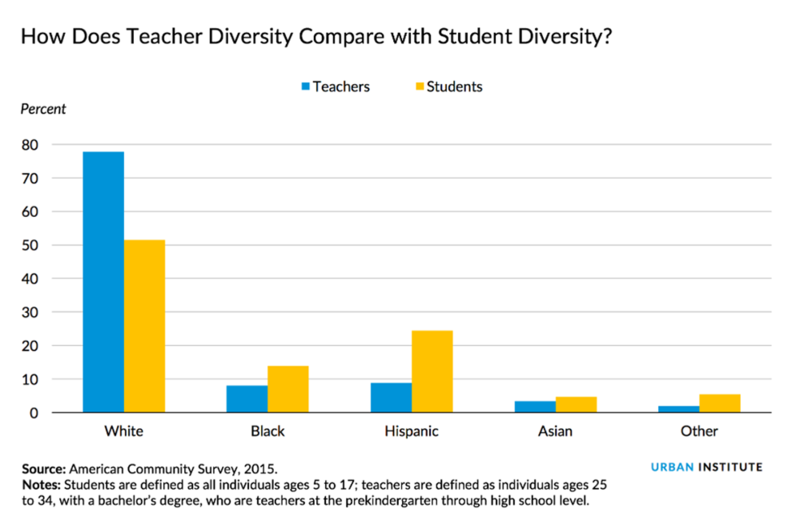 While whites still make up roughly half of all K-12 students, they occupy nearly 80 percent of all teaching jobs. Students of color — and especially Hispanics, whose ranks have exploded in recent years — too seldom see their ethnicity reflected back at them from the professionals leading their classrooms. 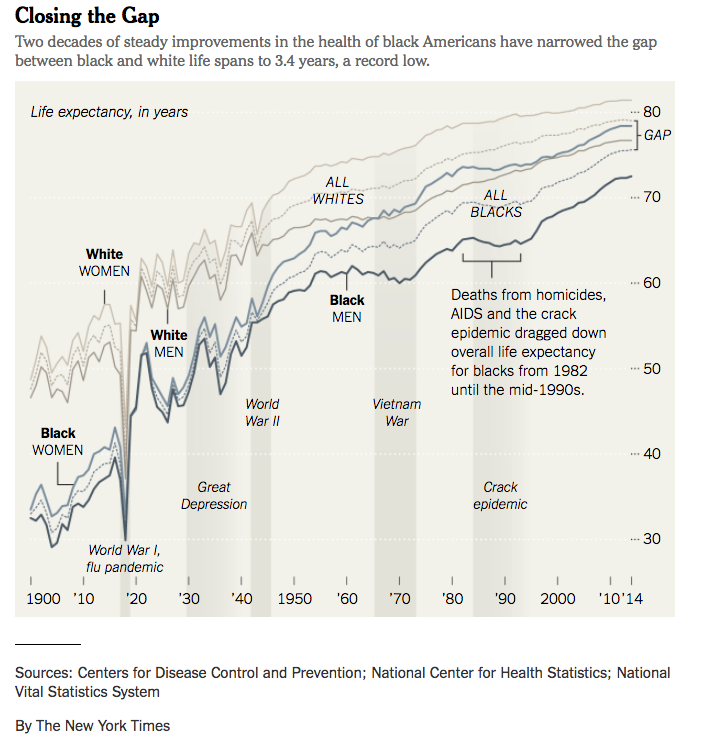 Meanwhile, the formerly yawning gap in life expectancy between black and white citizens has narrowed significantly. Black men in particular now live about a decade longer than they did in the Brown era. Beyond the physical and economic conditions of day-to-day life, Americans themselves have tended to characterize the relationships between races as improving — until recently. 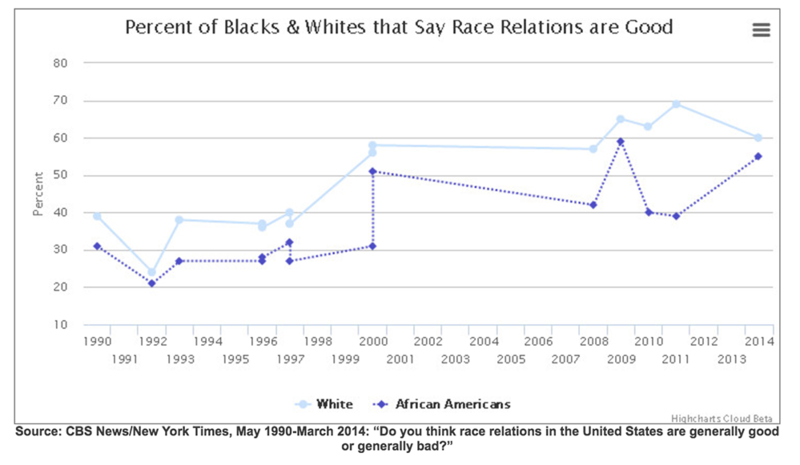 Just 28 years ago, only about 40 percent of whites and 30 percent of blacks said that race relations between the two groups were good. Toward the end of the Obama presidency, roughly 60 percent of both demographics said that they were. Still, those kinds of perceptions are subject to wild fluctuations. The presidency of Donald Trump has altered the picture in just its first few years, according to polling from YouGov. 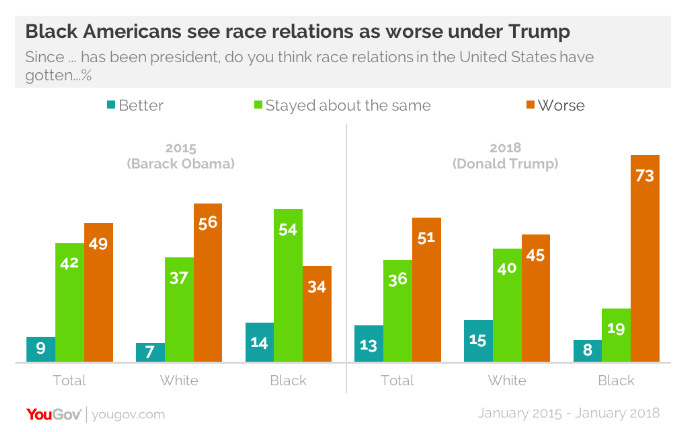 While whites are more than twice as likely to say that race relations are better under Trump than under Obama, blacks are more than twice as likely to say that they have gotten worse. The past 64 years have seen large numbers of black citizens living longer and more prosperous lives, and a widespread acknowledgement among both blacks and whites that they are living together more harmoniously. At the same time, hard-won inroads in academic performance and school integration have leveled off or declined over the past few decades. So what’s coming next? The actuarial tables make one thing clear: In the coming years, the population of America’s schools will be less white. And less black. According to research from Pew, the percentage of nonwhite students in K-12 schools is already over 50 percent, and it will increase to roughly 55 percent by 2022. But that growth isn’t powered by a boost from the number of black students, which is projected to shrink. Instead, growing numbers of Hispanic, Asian, and mixed-race children will fill more and more desks and classrooms as the U.S. continues down the road to becoming a minority-majority nation. That means that more power and influence will gradually be held by people who haven’t historically enjoyed it. By the calculations of the Brookings Institution, white people will constitute a minority of the middle class within the next 25 years. If that projection is borne out, by the time Brown v. Board of Education approaches the century mark, the main group driving consensus in both the American democracy and the American economy will be monolithically … diverse. 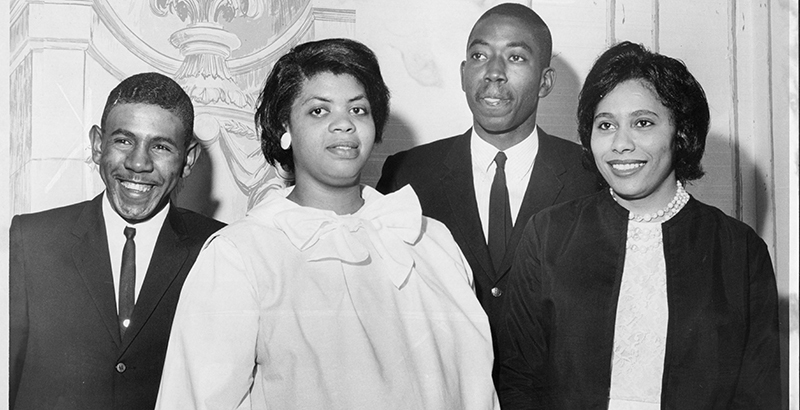 It’s hard to believe that Linda Brown, or the nine white men who heard her case in 1954, could have seen that coming.